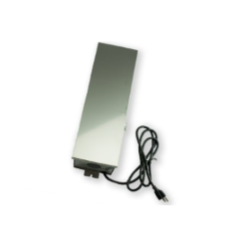 This Low Voltage power supply is compatible with all Integral Lighting Xenon and LED fixtures. Low voltage (12 volt) magnetic transformers do not output a standard 12 volts. They output a fraction (typically 10 percent) of your power input. To maximize the life of either your bulb or LED, be sure to confirm the output power with a digital volt meter. Visit our FAQ section for more help on sizing a transformer, or call us at 800.861.1364.